Provide FlyData with MySQL Information – FlyData Inc.
For FlyData Sync to work properly, you will need to provide FlyData access information to your MySQL server and the name of the databases to replicate on Amazon Redshift, and the table schema for the tables within the databases you want to include. Within the FlyData web interface, click on Dashboard -> Your Data Entries to get to the page for data entries. Once on that page, create a new MySQL data entry. Be sure to give a recognizable data entry name in the Name field. Select MySQL as the data source. Now you should enter your MySQL credentials. Username: the name of MySQL user. 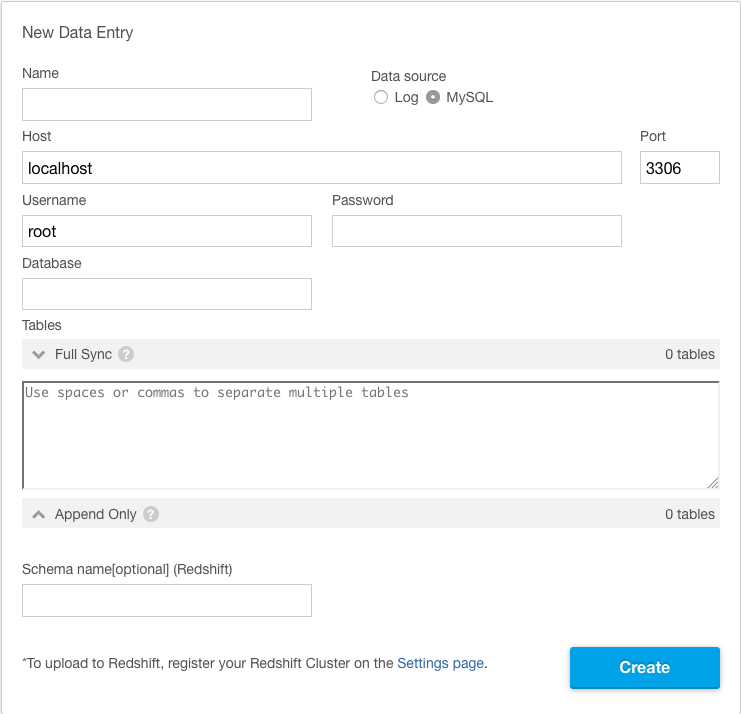 Database: the name of a database that contains tables you want to replicate on Amazon Redshift. Table: the name of the tables that you would like to replicate. Full Sync: The “Full Sync” mode will sync any INSERT/UPDATE/DELETE/ALTER TABLEs made to the MySQL table(s) you specify. Append Only: The “Append Only” mode will sync everything except DELETEs made to your MySQL table. Schema: If you use a non-default Amazon Redshift schema, be sure to enter the Amazon Redshift schema name. When you’re finished, click Update to save your changes.